The Media and Climate Change Observatory (MeCCO) analyzes traditional/legacy media representations of climate change. MeCCO team endeavors to comprehensively aggregate, monitor, appraise and critically examine media coverage that influence the spectrum of possibility for effective responses to ongoing climate challenges. The MeCCO team monitors coverage monthly in fifty selected sources globally, and eight country profiles (Australia, Canada, India, Japan, New Zealand, Spain, UK, US). October media attention to climate change and global warming was down just slightly (7%) throughout the world from the previous month of September 2017. This decrease was felt regionally in Africa, Asia, Europe and North America, while counts held steady in the Middle East and as they increased slightly in Oceania and South America. Compared to counts from fifty-two sources across twenty-eight countries in seven regions around the world in October 2016 (a year ago), the global numbers were up about 7%. However, coverage in the month was 37% below the average number of stories appearing each month in 2017 (approximately 3631 stories per month from January - October 2017). Scaling down from the global to monitoring in eight countries, coverage was also up from the previous month of September 2017 in Australia (20%), Spain (2%) and New Zealand (27%). Coverage was down in Canada (-19%), Germany (-9%), India (-7%), the United Kingdom (UK) (-21%), and the United States (US) (-18%). Figure 1 shows these ebbs and flows in media coverage - organized into seven geographical regions around the world - from January 2004 through October 2017. Figure 1. Media coverage of climate change or global warming in fifty-two sources across twenty-eight countries in seven different regions around the world, from January 2004 through October 2017. With our expansion of monitoring into Spanish-language and German-language coverage in recent years, Figure 2 shows word frequency data from three representative Spanish-language sources (on left): El País (Spain), La Nación (Argentina) and El Nacional (Venezuela). These are words (four letters or more) in articles containing the terms 'calentamiento global' or 'cambio climático'. Word frequency data from two representative German-language sources (on right) are TAZ - Die Tageszeitung and Süddeutsche Zeitung (both from Germany). These are words (four letters or more) in articles containing the terms 'klimawandel' or 'globale erwärmung'. Figure 2. Word clouds showing frequency of words invoked in media coverage of climate change or global warming in the Spanish-language press (left) and German-language press (right) in October 2017. Figure 3 shows word frequency data in the United States (top left), Canada (top right), Australia (bottom left) and India (bottom right) in October 2017. The five representative US sources are The Washington Post, The Wall Street Journal, The New York Times, USA Today, and the Los Angeles Times. The three representative Canadian sources are The Globe & Mail, The National Post and the Toronto Star. The five representative Australian sources are The Age, The Australian, The Courier Mail, The Daily Telegraph & Sunday Telegraph and The Sydney Morning Herald. The four representative Indian sources are The Hindu, The Times of India, Hindustan Times and The Indian Express. Figure 3. 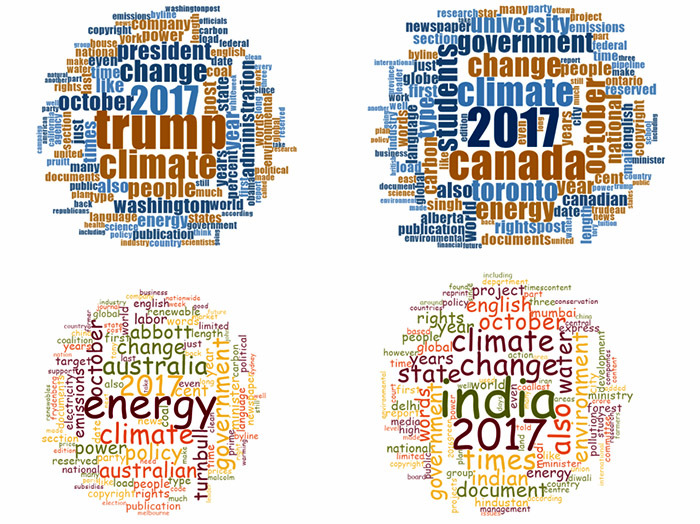 Word clouds showing frequency of words (4 letters or more) invoked in media coverage of climate change or global warming in the United States (top left), Canada (top right), Australia (bottom left) and India (bottom right) in October. As Figure 3 (top left) shows, in the US, media attention continued to focus on movements relating to the Donald J. Trump Administration (in)actions. While this was also the case in previous months of 2017 around the world (see Figure 2 in the February 2017 for an example of Trump coverage in Australia, New Zealand and the UK), the 'Trump Dump' - where media attention that would have focused on other climate-related events and issues instead was placed on Trump-related actions (leaving many other stories untold) - appears to be limited to the US media-scape in October 2017. In US news articles related to climate change or global warming, Trump was invoked 2399 times through the 274 stories this month (a remarkable ratio of nearly 9 times per article on average) in The Washington Post, The Wall Street Journal, The New York Times, USA Today, and theLos Angeles Times. However, in contrast in the UK press, Trump was mentioned in the Daily Mail & Mail on Sunday, Guardian & The Observer, The Sun, the Daily Telegraph & Sunday Telegraph, the Daily Mirror & Sunday Mirror, The Scotsman & Scotland on Sunday, and The Times & The Sunday Times 535 times in 498 October articles. These stories lead into wider considerations of attention paid to political content of coverage during the month. In this arena, Lisa Friedman and Brad Plumer from The New York Times reported in mid-October on US EPA Administrator Scott Pruitt's initiation of the federal rollback of the Clean Power Plan, despite the lack of a replacement measure to propose in its place. Timothy Puko from The Wall Street Journal reported on power plants nonetheless staying the course for emissions reductions plan due to technological capabilities, consumer demand and cheap natural gas driving demand. While reports of morale being lifted in some coal companies and the coal community, widespread opposition like that reported by Oliver Milman in The Guardian effectively characterized the outdated effort like something akin to saving the eight-track tape in the age of digital music production (a major difference being that this EPA rollback cuts to the heart of carbon-based industry and society as well as to one of the greatest environmental challenges of the 21st century). And as politics met economics in October, Nathan Bomey in USA Todayreported how two big US auto companies - General Motors and Ford - announced plans to introduce over thirty models combined in the next five to six years while news reports at the end of the month discussed the US Bureau of Labor Statistics new data that US solar installation and wind technician jobs are the fastest growing, with plans to double by 2026. These business trends and innovations were discussed as catalysts for policy measures to potentially follow. In October, coverage relating to ecological and meteorological issues grabbed a great deal of attention. Stories like a piece in The Times (UK) on floods and landslides killing at least 68 people in Vietnam after a tropical depression hit the central and northern regions of the country in early October were followed by stories like an article by Jacques Leslie in the Los Angeles Times about the devastating northern California wildfires and their record-breaking human toll as well as widespread property damage, and a piece by Dino Grandoni in The Washington Post (US) linking these wildfires to economic costs to the US Federal government. Across the globe in October, there were a range of stories that pervaded the cultural arena. Polls in October pointed consistently to willingness to support and take action on climate change around the world. For example, Seth Borenstein and Emily Swanson - in an article then run in a number of national sources - reported on a poll from the Associated Press-NORC Center for Public Affairs Research and the Energy Policy Institute at the University of Chicago that more than half of US Americans want state and local governments to step up and act on climate change in the absence of US Federal action. And amid many scientific studies on climate change and interconnected issues in October, Amina Khan from the Los Angeles Times covered a new study in Science Advances linking strains in the marine foodweb, ocean warming, El Niño Southern Oscillation and a changing climate. Heading into the United Nations climate change negotiations (COP23) in Bonn, Germany on November 6-17, preceded by a much-anticipated US Global Change Research Program Report released by thirteen US agencies in early November (with findings at odds with the stance of the Trump Administration), November will be a fascinating month for news on climate change or global warming. We will also see if the 'Trump Dump' influence continues to wane in the months to come.